St. Louis Cardinals catcher Yadier Molina one of the most durable catchers in baseball, has a torn ligament in his right thumb and will miss 8-12 weeks following surgery, the team announced. 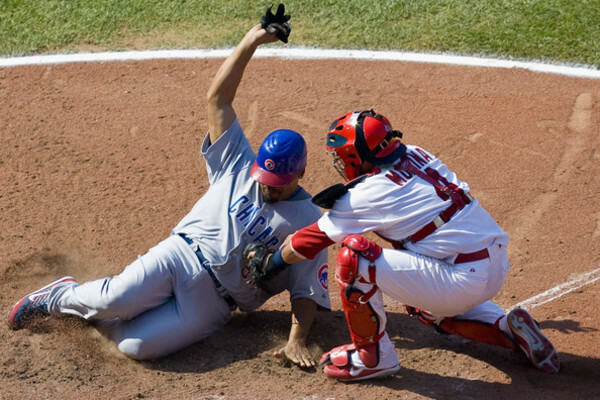 Molina suffered injury after sliding into third base, though it was a foot-first slide in a game Wednesday night. “I almost cried,” Molina said, when he was told the news.In 83 games and 335 plate appearances this season, Molina is hitting .287/.341/.409 (109 OPS+) with 16 doubles and seven home runs. Tony Cruz, Molina’s backup, will be the everyday catcher for now, however the team could look for catching help. Veteran catchers A.J Pierznyski and John Buck recently were designated for assignment by the Boston Red Sox and Seattle Mariners, respectively. “We’ll see what’s out there that makes sense for us.” Cardinals GM John Mozeliak said. “You just don’t find a catcher like that in the middle of the season. From a standpoint of trying to replace him, it’s not even a logical question.